The pour inspired a perfect, thick, one inch head on top of a bright orange body. The carbonation was heavy and consistency clear when held slightly above the eyes. A gentile swirl of the glass released a peppery aroma on top of the notes of Pilsner malts and Belgian yeast. A second agitation reveals additional aromas of hops and candi sugar. The bouquet is not as prominent as a typical Saison style, but this is not a typical Saison. The beer’s complexity unfolds as it wanders on the palate. No flavor really dominates despite the inclusion of sweet potatoes in the fermentation. The mouthfeel is characteristic of a Saison, with the carbonation allowing the spices and complex yeast flavors to dance on the tongue. The finish is interestingly dry, perhaps from the sweet potatoes. What does the addition of a starch do to beer anyway? If only I had bought two of these so I could try one after aging. As the beer warms, the sweet potato flavor emerges slightly. At least that is how I remember Allagash Fluxus 2009 the day after. While time and sobriety allow for a more decorated story, more credible reviews than mine of nearly every beer available are readily available on RateBeer or Beer Advocate. Each can be accessed from your home computer or even your Smartphone of choice right from the liquor store aisle. 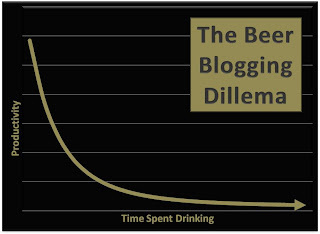 My internal battle… whether or not a review on a beverage is worth a blog post. Will not a simple tweet do the trick? The web is littered with Joe Webloggers and their opinions on their favorite beverages. For the most part, the posts are about as interesting as reading about their family vacation or funny things their cat does. Here at TheFerm.org, our charter was to share drinking related experiences, but Google Analytics provides evidence that readers are more likely to land on the page if we mention Russian River’s “Blind Pig” than if we cover SAVOR. If the goal is to only attempt to share something about our passion for fermented beverages with the blog reading public, the clear move is to crank out short tasting notes posts. This guy either hates beer blogs or stories about cats! Weird. I didn't know the Prince of Pop enjoyed beer! Tee hee! I'm Bad! You know it! You know, I've run into that same problem: There's a beer (or three) that I'd really love to drink, but I was saving them for a blog write-up that I just don't have the means to do now. Blow it off or skip the beer? It's an incredibly difficult decision that a non-hobbiest-blogger wouldn't "get".